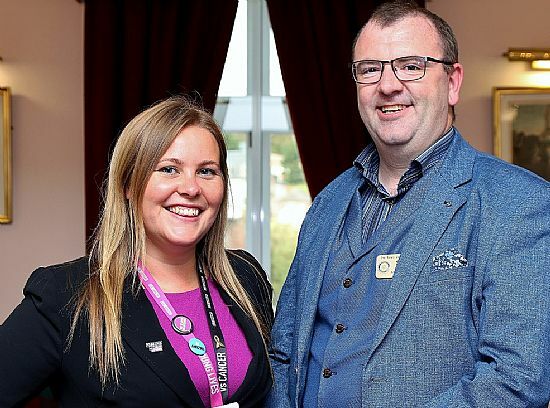 Donna Bednarek, pictured above with her host Steve Fairlie, gave a very informative talk on Tuesday about the charity CLIK Sargent, the leading children’s cancer charity in the UK. The origins of the charity lie in the 2005 merger of two former charities, Cancer and Leukaemia in Children and the Sargent Cancer Care for Children founded in memory of Sir Malcolm Sargent. Donna, the fund raising engagement manager for the charity in Scotland, explained the need to act after a child has been diagnosed with cancer. Someone should be there to meet the family and give support during treatment which can only happen in Scotland at the Glasgow or Edinburgh hospitals. She added that the charity’s principle is ‘helping young lives to thrive not just survive.' To this end, the charity provides home from home accommodation near the hospitals. The statistic that there are eleven children a day told they have cancer in the UK is quite frightening. However, the fact that four in every five children survive the trauma is very heartening and makes the charity’s work even more important. The charity will provide a family grant of £170 to help with initial costs towards accommodation, travel and personal effects. Then it is possible that the family can stay at one of 11 houses across the country while treatment is in progress, which on average lasts sixteen days at a cost of £33 a day. But of course all this comes at a cost and Donna highlighted the fact that the charity receives all its income from public donations. She is also able to lead from the front and do her bit as well; she is participating in the Scottish Run at the weekend on behalf of the charity. She is very proud of the charity’s track record with nearly six hundred supported cases in Scotland. Donna’s passion and enthusiasm for the work came through very clearly during her talk which was well-received by the Members who can now count themselves a little wiser about this harrowing situation of cancer in children.